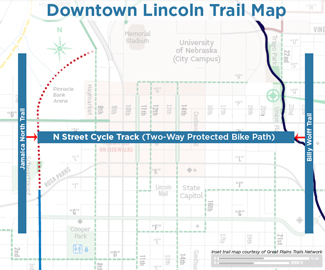 Downtown Lincoln’s ‘N’ Street two-way protected bikeway has finalized plans and is set to be completed by October 2015. The City of Lincoln recently announced its selection of Meco-Henne Contracting Inc. to construct the bikeway. The Omaha-based firm, also the contractor for the Centennial Mall project, plans to start construction of the bikeway this March. The initial phase will include work on 7th-10th Streets and 14th-16th Streets. When completed, the protected bikeway will provide a safe, bi-directional path along ‘N’ Street from Antelope Valley to the West Haymarket area, a critical link in the City's 128-mile trail network. The new bikeway will connect the Billy Wolff trail to the east and Jamaica North trail to the west, linking bikers with Downtown Lincoln offices, shops, restaurants, parking and entertainment establishments. "Because the bikeway will be a dedicated space, separated from other traffic, it will make downtown safer and more enjoyable not just for bikers, but also for motorists and pedestrians," said Ernie Castillo, City Urban Development Department. "More than 87,000 people live within two miles of the 'N' Street protected bikeway, so the project will make downtown more accessible to about one-third of Lincoln's residents." The Downtown Master Plan originally labeled our city’s core as the “last mile” of missing bike trail. In its efforts to fill the aforementioned gap, the City of Lincoln selected Alta Planning & Design and Olsson Associates to develop the now completed concepts, master plan, design and construction documents for the ‘N’ Street protected bikeway. Alta was the lead for the conceptual and master planning tasks. Alta has previously worked on bikeway projects in cities that include Calgary, Portland, Seattle and Des Moines. Olsson Associates, now headquartered in the West Haymarket, was responsible for the design tasks. Along with the City’s Urban Development and Public Works departments, PC Sports has been hired to oversee the project and will work with businesses and the contractor to minimize problems. Downtown Lincoln’s new bikeway will have a profound effect on the face of ‘N’ Street. The street is one of Downtown Lincoln’s east-west connector streets that runs through the middle of the Central Business District. A typical ‘N’ Street block consists of three vehicular lanes with a mix of angled and parallel parking on the north and south side of the street. Once the protected bikeway is complete, the street (from south to north) will include a two way bike path, a raised concrete median, a parallel parking lane, two lanes for vehicular traffic and an angled parking lane. The concrete medians will serve as extra protection for bikers from vehicular traffic. These barriers will vary from block to block, but the majority of the medians will be between three feet and nine feet wide. The three feet wide barriers will include simply a concrete median, and the wider sections will incorporate bioswales and other landscaping features. Alta’s plans identified an opportunity to capitalize on additional project funding from the City’s Watershed division by designing stormwater infiltration planters in the buffer between the bikeway and parallel parking and in pedestrian refuge islands at each intersection. The final design and construction costs for the ‘N’ Street Bikeway will total $3.35 million. The project has been funded by a combination of public and private sources, including a $340,000 commitment from the Great Plains Trails Network. The Great Plains Trails Network, a group of citizens who advocate and support a network of trails in and around Lincoln, have been strong champions for the bikeway and helped rally support from other community organizations including PeopleForBike’s, Jayne Snyder Fund and the Nebraska Trails Foundation. Their dedication, along with the commitment from Mayor Beutler and the City of Lincoln, has helped transform this project from plan to completion.